Latest entry is at 7pm. Latest Entry is at 6 pm. The oceanarium will be at its busiest during weekends and holidays. We are comparing Oceanario de Lisboa Skip The Line Tickets Prices from leading ticket suppliers and Try to find you Cheap tickets prices on the market. Welcome to one of the largest and most intriguing Oceanariums in the world. When you arrive at the Oceanarium you’ll first have to climb aboard the sunken ship to reach the entrance where you can skip directly to the front of the line. Something that adds a unique touch to this award-winning aquarium is the underwater exhibition by Aquascaper Takashi Amano. The Forests Underwater display fills a huge 40-metre-wide tank filled with 160 thousand litres of water. Take your time to marvel at the tropical rainforest interpretation and sway to the sound of Rodrigo Leao’s composition. There’s no rush for you to leave either, once inside Lisbon Oceanarium you’ll be free to explore at your own pace and stay until closing time. A fun and enthralling attraction for both adults and children. The oceanarium is great for animal lovers and anyone with an interest in seeing unique and exotic marine life. Suitable for wheelchair users and for people visiting with buggies and strollers. Your Experience With Oceanario de Lisboa Skip The Line Tickets? Visit the place that was named the best aquarium in the world in 2015 by Trip Advisor. 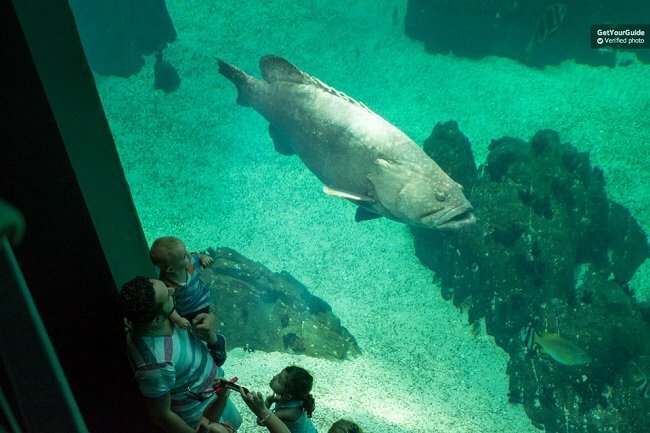 Take your time to identify the 500 species of fish that Lisbon’s Oceanarium hosts. See sharks and stingrays, sea otters, penguins, exotic fish, vibrant corals and some good old seaweed. ’Dive into’ Takashi Amano’s ‘Forests Under Water Exhibition. Walk between underwater habitats of the Tropical Indian Reefs, the Pacific Ocean, the Atlantic and the Antarctic. Try to spot local Mediterranean species inside of mammoth sized sea tanks. What Oceanario de Lisboa Skip The Line Tickets Includes? Fast track entrance ticket to the Lisbon Aquarium. If you would like to do some city sightseeing before or after visiting Lisbon’s Aquarium then we recommend booking the Combo entrance and 2-day Hop-On Hop-Off bus tour with Viator. Travelers Reviews about Oceanario de Lisboa Skip The Line Tickets? This magnificent Oceanarium is one of the top Lisbon attractions on Trip Advisor. It has an average rating of 4.5 out of 5 from over 32,000 visitors. Reviews are also very positive from Get Your Guide users who have given the attraction and overall score 4.7 out of 5. Visitors agree that it's worth paying pre-booking to skip the line as entrance queues can be over 2 hours long on busy days. Comments generally say that this is a wonderful and fascinating city attraction. Some reviews mention slight delays due to queues at ticket collection points however most visitors seem to say that the tickets and entry are very well organised. People have recommended visiting that their kids have enjoyed visiting the Oceanarium. Lisbon’s Oceanarium is fully wheelchair accessible. Tickets will be accepted at the Oceanarium entrance in printed or electronic form. Booking confirmation is usually sent via email. Refund and cancelation policy depends on your ticket provider. Tickets from Get Your Guide are usually refundable up to 24 hours in advance and tickets from Viator are usually partially refundable up to 48 hours in advance. Not all ticket providers issue refunds. Guided tours of the Oceanarium are available but must be pre-booked. Tours are offered in: English, Portuguese, Spanish, French and German. Educational activities can also be arranged in advance for groups or families. Meeting Point: meet at the entrance to the aquarium at you selected time slot. Address: Esplanada Dom Carlos I, s/nº, Parque das Nações, 1990-005 Lisbon.